It is quite common to want to use mathematical expressions in R. Specifically, mathematical symbols or entire equations may be needed when building plots. In this tutorial, we will examine how mathematical expressions can be included into R graphics. We will use the co2 data already found in R. The data includes the atmospheric concentrations of CO2 in parts per million. The data was recorded monthly at the Mauna Loa Observatory in Hawaii between 1959 and 1997. 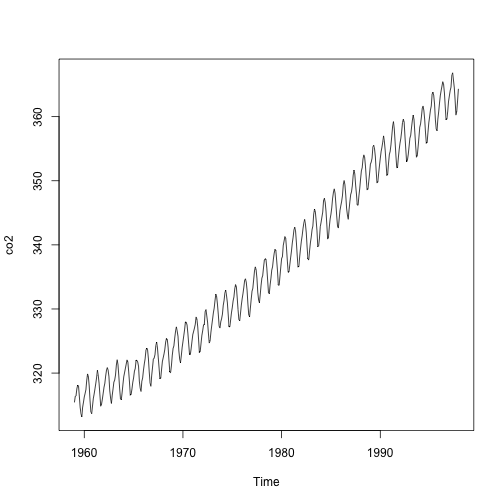 The following code loads the data and then creates a simple plot of CO2 versus time. This is a bit ugly and there is room to clean up the plot. We can use expression() to include mathematical expressions in the plot labels. We now see that CO2 on the Y-label has a subscript for the number 2. We can include more advanced mathematical expressions as well. For example, let’s add a title to the plot. Notice that here we used expression() in combination with paste() to combine multiple pieces of information. If you want to include a variable within a mathematical expression, you need to use substitute() instead of expression(). The plot shows how text() can be used with substitute() to insert mathematical notation with a variable CO2_level that can be altered or updated. As you can imagine, there are lots of possible mathematical expressions, depending on the specific context. You can use ?plotmath or demo(plotmath) to explore more options. Here are some possibilities which can be found by using ?plotmath.